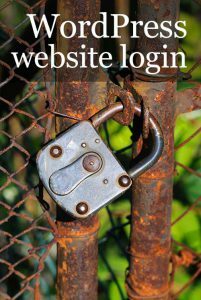 The requirements for WordPress website login, the default username, the default WordPress login URL and how to find it, plus the lost password link. Also more advanced information on WordPress install folder, how to find that via FTP and adding an administrator via the database. (aka web address, link or WordPress login page). If you have the WordPress login URL, WordPress username and password you are ready to go! Navigate to the login form in your browser. 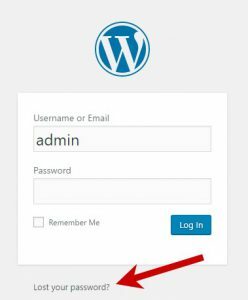 Type in your WordPress username and password into the login form fields and hit Log In. The WordPress default username is admin. Once logged in you will arrive at the WordPress Dashboard. However it is not always this easy! If you haven’t got all the requirements read on for further help. The default WordPress username is often ‘admin‘, although an experienced web developer will create a username that is much harder to guess. This helps to prevent a site being hacked. The password is chosen either during the WordPress install, or by the person that added you as a user. If you have lost a password, click the “Lost your password” link, as per the image below. Clicking this link takes you to a screen on which you can enter a username or an associated email address. Now click “Get new password”. An email will be sent to the associated email address allowing you to click a link and reset the password. The system will never send the current password. Check the email account, then reset the password using the reset password link. If you no longer have access to the email address associated with your WordPress account you will not be able to reset the password using the steps above. If you have access to a control panel or the password to the database it is entirely possible to change a password, or add another administrator associated to a current email address by accessing the database directly. I would advise help from a web developer with MySQL experience. URL stands for Universal Resource Locator and it more or less means website address. However, this could have been changed by the website creator. A website developer could also have hidden the default WordPress URL for security reasons, so it could be something more obscure. If the default WordPress URL does not bring you to the login screen, the easiest way to find the correct URL is by contacting your designer. If this is not an option read on. If you’ve lost touch with the website developer the next option is to use an FTP client to view the files on the server. FTP stands for File Transfer Protocol. An FTP client is a programme that allows us move files from a computer to a server. There is sometimes a ‘file manager’ available within the control panel of the ISP, this will do the job. Log in to discover if the WordPress install is contained in a folder. This gives an idea of the location of the WordPress website login page. WordPress security plugins can be implemented to hide the default WordPress URL, increasing security on the site. When trying to access the default WordPress login screen users are faced with a 404 error message. If you suspect you have a WordPress security plugin installed then you will need to use an FTP client to login, and navigate to the plugins folder, within the WordPress install. We want to temporarily disable the plugin, so you can login. Rename the security plugin folder e.g. “better-wp-security” could become “disable_better-wp-security”. This will disable the plugin, disabling all security features, until you revert back to the original folder name. Now use the default WordPress URL to gain access to the site and make some necessary changes. Please do make sure you revert back so your website remains secure. TIP: Try reverting the folder name whilst you are still logged in. WordPress may log you out because of the security plugin, but if not go to the security settings and find the hidden URL. Note this down for next time you want to log in. If you have the control panel details for the ISP who host your website, you should be able to access the WordPress database using PHPMyAdmin. Once in the correct WordPress database add an administrator which is associated to a current email address. There is a great tutorial on WP Beginner that explains how to add an administrator using MYSQL. If you do not have experience, please be really careful here. Contact me or comment below if you would like help adding an administrator. Keep your password safe for next time, by using software, like KeePass. Logging in to WordPress is simple if you have the correct details to start with, however it can become a nightmare if you lose touch with the website designer. For help gaining access to a site, please do get in touch with me, a WordPress website designer or comment below. Hi Caroline, yes I can help you to log in to your WordPress website. Would you email me on design@kaydee.net, as we can start from the beginning, and try to get you logged in the simple way first.